The designation for this day in Holy Week is Maundy Thursday. The word “Maundy” relates to the English word “mandate” or “command.” The command is to demonstrate humble friendliness. On this night in the story of Jesus, there is a traditional dinner with friends, a demonstration of humility, arrest, condemnation, trial, and brutal behavior; this day in the Holy Week a mixed story of warm feelings and fear. If we had been there that night in Jerusalem, we would have felt both emotions. We would have been among friends; people we have been on the road with for over three years. Some of the people there would have been friends and maybe business colleagues for most of their lives. Others would have been people we would have beforehand dismissed as undesirable. With Jesus, we took a second look, liked, and understood these new associates. All the years we have followed Jesus down from Galilee to Jerusalem and to the outer reaches of Judaism,Jesus has healed, consoled, and taught, but mostly he has fed us with God’s words from the Torah, the Psalms, and the Prophets. However, it has been his example that has moved us mostly. Everywhere we have gone he has taken food, blessed it, and given it to us as an example of the great banquet of the resurrection. 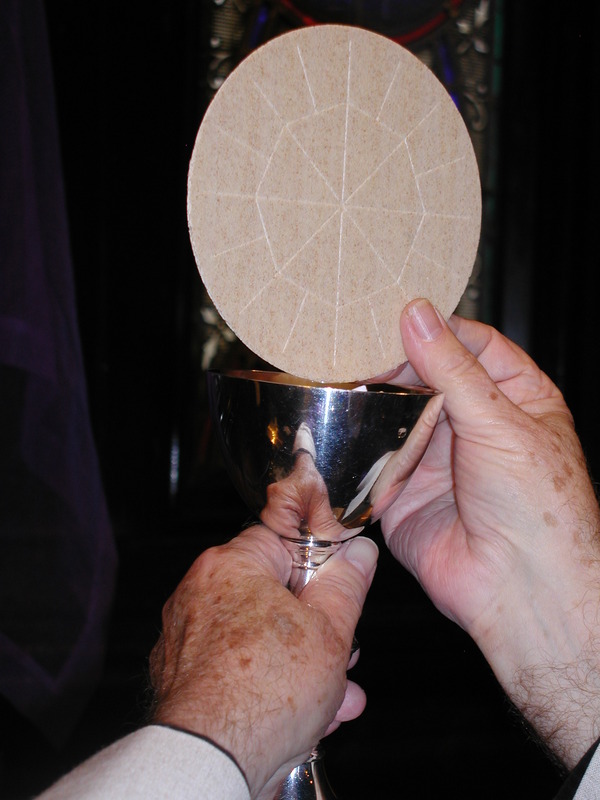 Tonight, however, he took bread from the Passover table, blessed, and gave it to us and then told us it is his body and that we should share this bread with the world in remembrance of him. He took the set aside Elijah cup of wine, gave it to us, and then tells us to drink from it. He then says it is his blood and we are to share the cup with the world in remembrance of him. It is a moving and deeply personal experience of friendship. Shocked by the next thing Jesus does, we object. He is the leader, the master teacher, deserving all our adulation and respect. Nevertheless, here he is coming to each of us washing our feet. Jesus has not completed this task until he commands us to do the same for others. It is an act of true humility and profound friendship. When we are in the presence of this man, we learn true humility and true friendship. Despite the tensions around us, we learn what it means to be humble in spirit and action and how best to demonstrate friendship; that is, the physical and spiritual friendship that blesses us individually and the world. We learn that this is what Jesus means when he talks about the reign of God and its nearness to us. To be Jesus’ followers we need to truly care for the needs of others and share the love God by feeding the physically and spiritually hungry. If we had been there that night, after the joy of sharing the Passover, we still have reality to face. We must strip the table from which we ate, clean the room where we sang the ancient songs and told the ancient story, and remove all the evidence of being there. The religious and civil authorities are not happy with the challenge of Jesus’ words. Therefore, we have to be careful. Possibly, after meeting the obligations of observing the Passover, had we been there, we expect Jesus will return to the safety of Bethany. However, he crosses the Kidron Valley and goes to the olive tree orchard and garden at Gethsemane to pray. Most of us do not know the nature of his prayer. Three have gone with him, but we can see they are as sleepy as we are from the good food and wine of the Seder and have fallen asleep. Abruptly awakened, however, from our drowsy condition by angry shouting, the intruding glare of torches, and men drawing weapons, we are surprised to see among the intruders Judas Iscariot, a member of the group. The joy of the Passover ends with the arrest of Jesus. All of these events, we see from looking back two millennia. Those who were there were shocked and frightened. They did not fully grasp the message of humble friendship demonstrated earlier in the evening. Neither did they understand the full significance of the balance of the night and the early Friday events. Still today all that happened that week in ancient Jerusalem remains a mystery to much of the world. Mystery is not actually the correct word. All that happened so long ago to a gentle being who taught that the reign of God begins with humble friendship and shared hope for a better world remains incomprehensible. In fact, that incomprehensibility keeps the world away from the experience of Jesus. Likely, he did not intend, God does not intend, to make all that happened on that Thursday night so long ago, outside of human understanding. However, those who have followed Jesus over the centuries have made Jesus’ message difficult to understand and to accept. We, who are today’s followers of Jesus, have before us the task of bringing to life the story of Jesusand his message of hope. We can do it mostly by living Jesus’ teachings; that is, by living as humble friends of those in need of Jesus’ friendship. Thanks, Roger, for taking the time to read the meditation for Maundy Thursday. I have always loved this poem and picture.